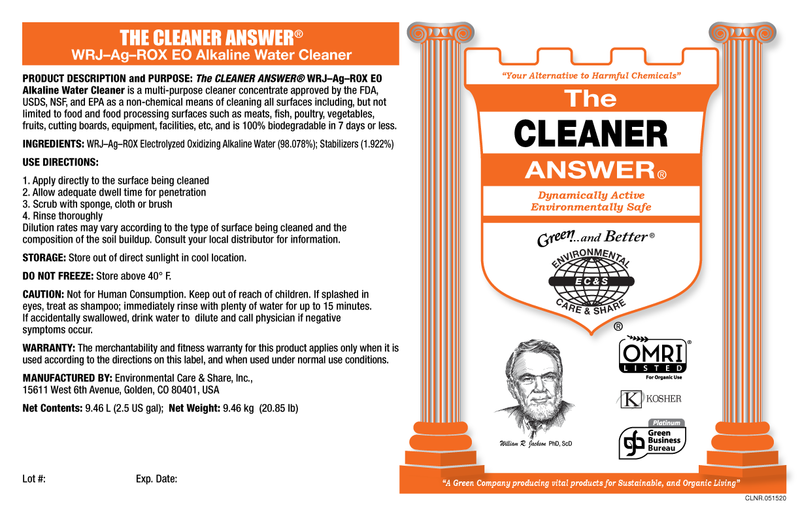 What is THE CLEANER ANSWER® & what is its purpose? 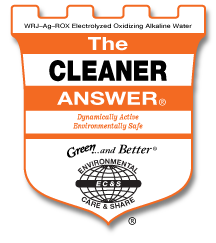 The Cleaner Answer® is a multi-task cleaner produced from alkaline water manufactured by the WRJ-Ag-ROX EO Water Equipment that takes the place of a wide range of harsh chemical cleaners. It is clear and nearly odorless, non-staining, non-flammable, and non toxic. Extremely versatile, it can be used in hard, soft and salt water, and works well even in cold water. In concentrated form, The Cleaner Answer® is 100% biodegradable in the environment in the optimum desirable time of 7 days. Substances that biodegrade too quickly are considered “biostimulants” and pollutants as cleaners: Substances that biodegrade in excess of 7 days are classified as “hard” chemicals and are hazardous to human health. The greatly decreased hydrogen ion concentration (high pH) and balanced ORP (oxidation/reduction potential – measured in millivolts) of The Cleaner Answer® provides the necessary molecular energy for the maximum emulsifying and chelating action that is required to remove the oils, greases, protein, other substrate and invisible substances to which dirt, bacteria, fungus and algae adhere, and to remove carbon deposits and breaks down calcium and other scaling substances. 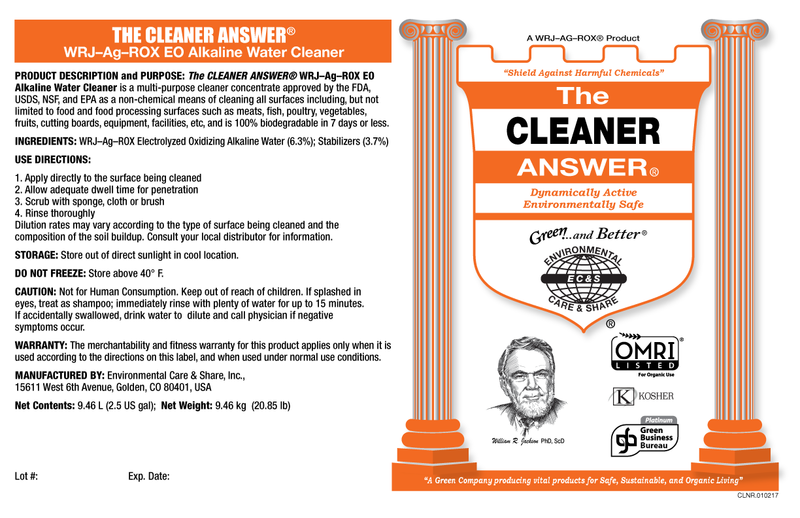 The Cleaner Answer® may be diluted with either standard tap water – which will decrease the pH, or with WRJ-Ag-ROX alkaline water – which will increase the pH and thus, the cleaning action. • Clean from the bottom up; Rinse from the top down. • Apply the “4 Variables of Balanced Cleaning” to fit your Time & Cost Requirements. 1. Formula - The dilution ratio and pH of the diluting water. 2. Dwell Time – The amount of time the product ‘soaks’ on the surface. 3. Energy – The use of heated water for dilution. 4. Agitation – The use of power washers or scrubbing action. As a concentrate, The Cleaner Answer® is in the 10.5 pH range and can be used on all water-cleanable surfaces with this range of pH tolerance. Though extremely active in a wide range of pH conditions, low pH environments may slow cleaning action. Store out of direct sun light. Do not freeze. A few states require specific information. If your state is not listed below, use the "GENERAL" label.